For the removal of toilet tar and other deposits from aircraft toilet systems. Deep Soak is a highly concentrated toilet cleaner for removing tar-like deposits and accumulated paper build up from aircraft toilet tanks and systems. It is best used as a regular system cleaner for both vacuum and recirculating toilets, however, Deep Soak can also be used to clean aircraft toilet systems that have been removed from aeroplanes for major overhaul. Why is Deep Soak needed? As well as normal toilet usage, various fluids are often emptied into aircraft toilets including tea, coffee, milk, alcohol, orange juice etc. The combination of these fluids creates a significant tar build up that is very sticky and difficult to remove by normal methods. Improves daily toilet performance that helps to prevent foul odours. Used on a regular basis, this product will clean the aircraft tanks & systems and maintain the efficiency of the filters, pumps, tanks and pipe work. Use regularly on Vacuum and Recirculating toilets to prevent system blockages and foul odours. Add 2 liters of undiluted Deep Soak to each toilet. Flush once then leave toilets for minimum 2 hours. Flush once then leave toilets for minimum 2 hours. After soak time toilets can re-enter service without rinsing. Deep Soak can be used undiluted or mixed with water 50/50. Fill the waste pipe system with Deep Soak back to the toilet bowl. Check aircraft manuals for lock out valves/levels/sequence to avoid overfilling any bowl in the system. 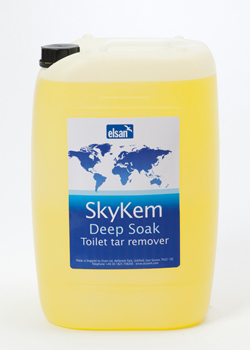 Add SKYKEM Deep Soak and water solution into the toilet holding tanks filling up to the toilet flap valves in the bowl. Leave mixture to attack tar build up for as long as possible with a minimum 2 hours soak time. Flush the toilet regularly to assist in removing waste. Drain the cleaner and thoroughly rinse the system with clean water to remove all cleaner and tar deposits. Add SKYKEM Deep Soak full strength or diluted into the toilet holding tanks filling up to the toilet flap valves in the bowl. Leave mixture to attack tar build up for as long as possible with a minimum 4 hours soak time. Flush the toilet regularly to assist in removing waste. Use Deep Soak at full strength or diluted to a maximum 1 part in 3 parts water. Deep Soak is not classified as harmful and is safe for air and sea transportation.